This photography art catalog uses a colonial-era, Latin-American art tradition to portray the lineage of contemporary American families. Photographer and artist Delilah Montoya investigates the ethnic roots of contemporary families living in New Mexico and Texas in this thought-provoking collection. Featuring sixteen present-day photographic group portraits along with a DNA study for each clan, Montoya mimics and explores the Latin American art tradition of casta paintings that traced the complex racial mixing of the people of New Spain in the eighteenth and early nineteenth centuries. Typically presented as a group of sixteen portraits, the casta paintings illustrated the social hierarchy of the times, with the “pure blood” Spaniards at the top and mixed-race mestizos and mulattos at the bottom. Like the colonial-era casta paintings, Montoya’s photographs capture her subjects at home and include material objects, furnishings and even pets. But instead of using eighteenth-century terminology, the ethno-racial composition is represented with a DNA study of the matrilineal and patrilineal global ancestral migration to provide additional information about the family’s origins. The artist investigates the cultural and biological forms of hybridity and seeks to understand the impact of class structures on social, economic and aesthetic choices in America. 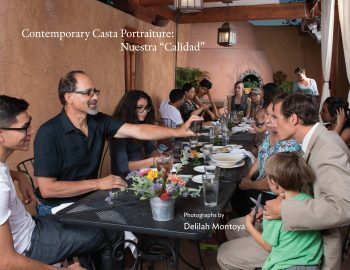 Contemporary Casta Portraiture includes an artist statement and essays about Montoya’s work. In her introduction, Surpik Angelini says Montoya’s work surpasses “nationalist, ethnic categories to suggest instead the making of a cosmic race.” Ultimately, this intriguing volume confirms that none of us are very different from each other. DELILAH MONTOYA received a Bachelor of Arts in studio art in 1984, an MA with honors in print-making in 1990, and an MFA with distinction in studio art in 1994, all from the University of New Mexico. She was one of the five graduating students in the nation to receive a College Arts Association Professional Development Fellowship in 1993 to support her MFA thesis project, Sagrado Corazón/Sacred Heart, which was exhibited extensively. A professor of photography and digital media at the University of Houston, her work appears in Voices in Concert: In the Spirit of Sor Juana Inés de la Cruz (Arte Público Press, 2015) and Women Boxers: The New Warriors (Arte Público Press, 2013).